Back in May, I shared some of my favorite tips for keeping your complexion clear and acne free. This is also when I began my journey to clear skin with Differin® Gel. Just because we are past our teen years, doesn't mean we are past skin breakouts. In fact, I break out more now than I ever did in my teens! Being able to add just one acne product into my already existing skincare routine was perfect. I am able to focus on healthy skin while treating my mild acne in the process. If there every was a month to subscribe to BOXYCHARM it is now. In my last box review I questioned if they could push beyond the tired made for Instagram photoshopped "makeup" and actually curate a top-notch seasonal box once again. I am pleased to say they have done it for July. Lets take a look at what's inside! Because there is a seriously awesome eyeshadow palette in here! 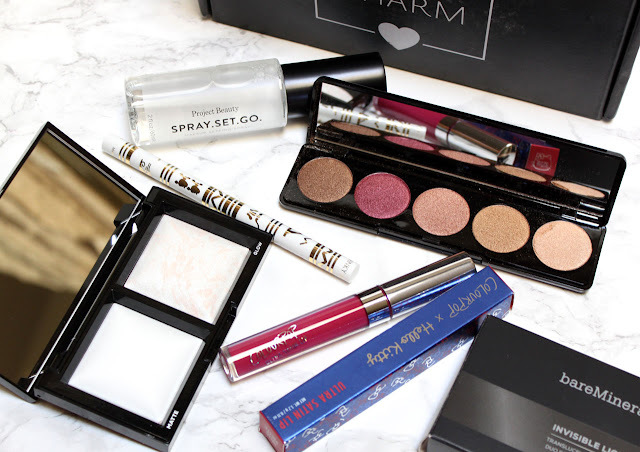 First off, if you're not familiar by now BOXYCHARM is the only beauty box still worth subscribing to. For $21 mo. you get 4-5 full size beauty products at over a $100 retail value. Even on months where it's a little ho hum there's always one product worth the price of the box. 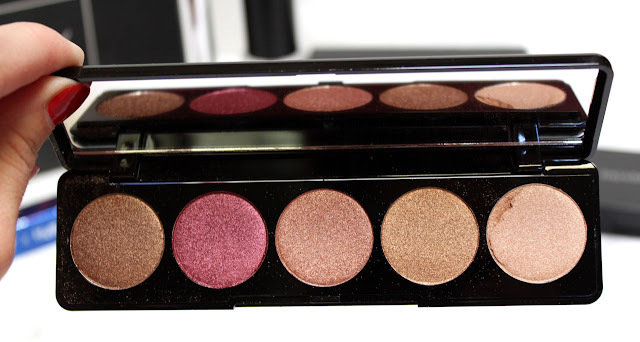 This palette features a combination of 5 highly-pigmented jewel tone eyeshadows. 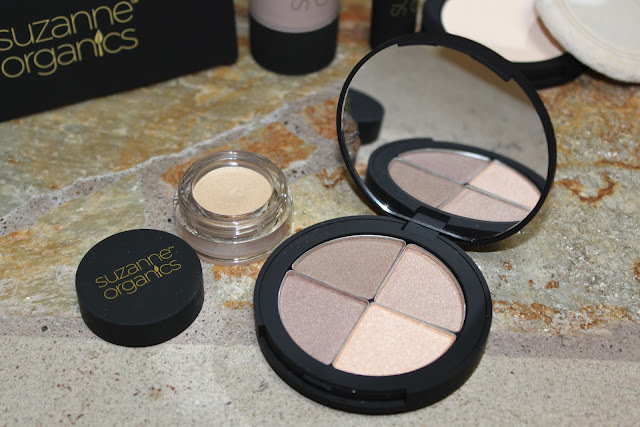 The shades beautifully pair together to give you a gorgeous, golden eye look. 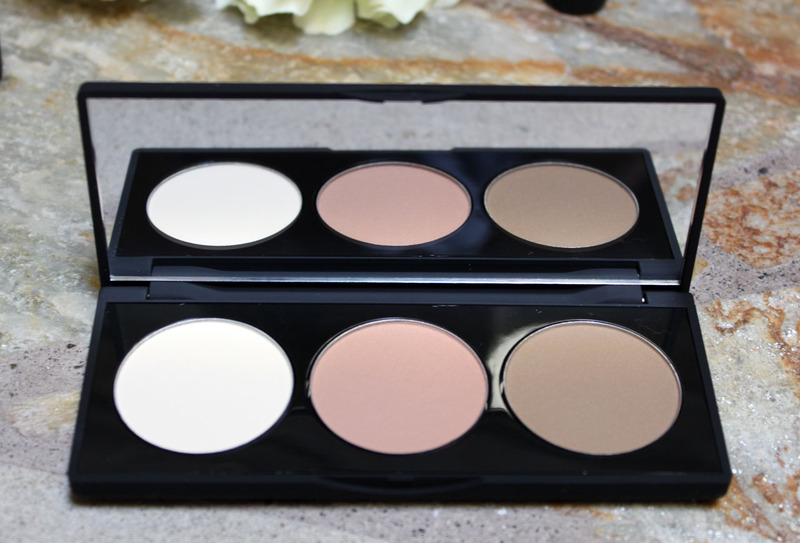 Boxy always brings it with the compact neutral eyeshadow palettes and I never get tired of receiving them in my boxes. This set is stunning! The eyeshadow formula here is seriously amazing. It's like a powder/gel/cream hybrid that glides on with the most intense pigment and gives your eyes such a beaming glowy look. The colors are so beautiful! The shimmering neutrals are bronzey enough for Summer but give you those deeper jewel tones to take you in to Fall. I swatched these in one swipe with NO primer. Seriously, these are some of the best formulas for eyeshadow's that I have tried in a long time. This palette compliments the NAKED Heat Palette really well. 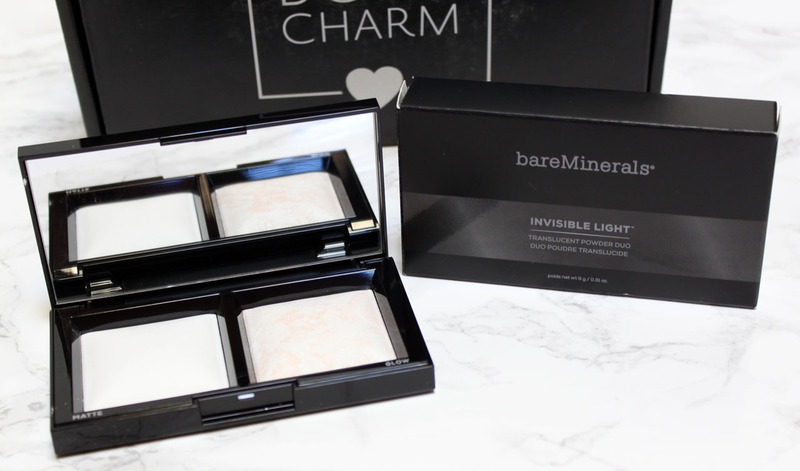 Because it is Boxycharm stamped I thought it might be exclusive to the box, but it's not! You can buy it (although, for $45) on the blinc website HERE. It's worth it though, I have been wearing this every day since I got it. It has quickly become my favorite palette to use for shimmery lids. On the insert card it said this was the ultra-matte lip, but I received an ultra-satin lip which I was even more happy with. I didn't care for the Colourpop matte lips so I was hoping this finish would be less dry and it is. Subscribers will receive one of six shades. The color Hello Pretty is a deep raspberry pink. 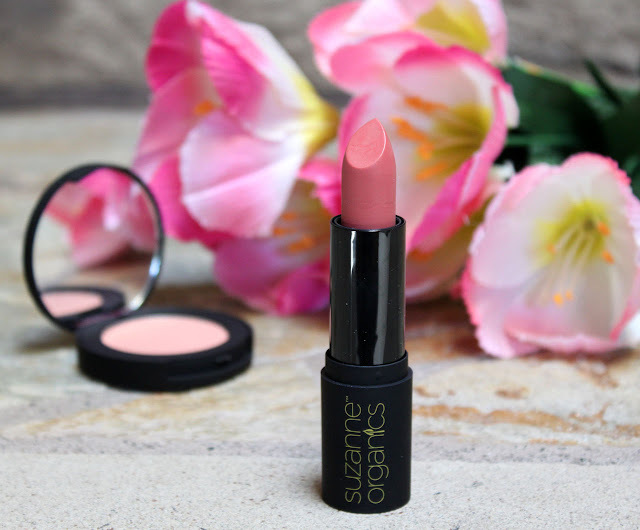 I am a pink lipstick girl and this is such a pretty tone, I know I will be reaching for this one a lot come early September when I start to transition my lip colors. Here is where BoxyCharm cemented that July's box was awesome (if that eyeshadow palette didn't do it already!). We actually have a name brand in here again! This silky and ultra-fine combination of setting powder and finishing powder instantly vanishes on all skin tones. 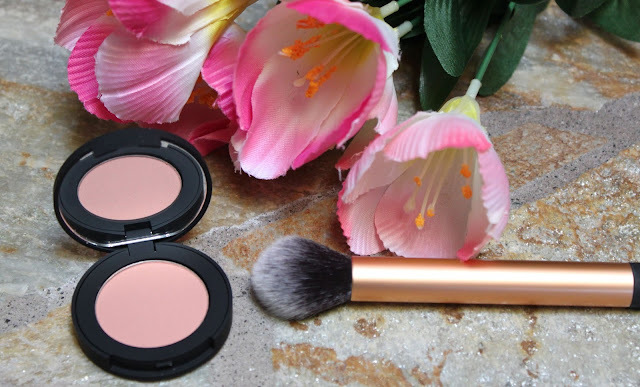 I really loved the concept of this duo being a matte setting powder and a luminous powder. 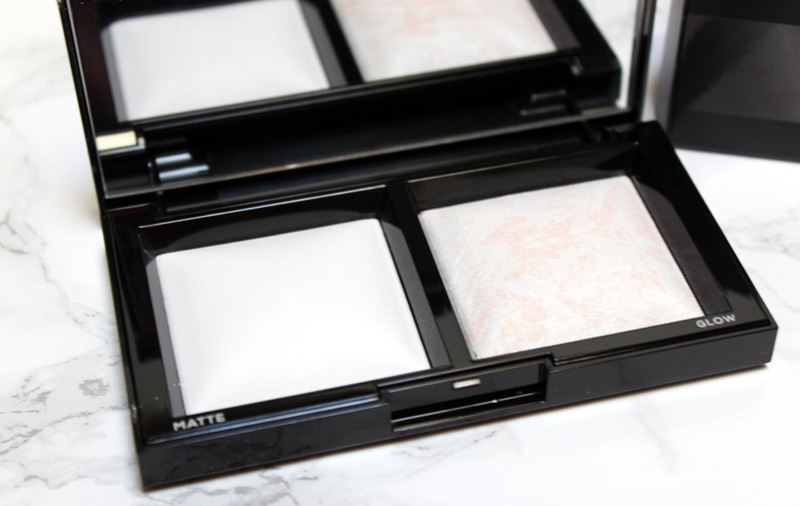 It reminded me a lot of NARS Invisible set and the Hourglass ambient lighting powders combined. The matte powder sets beautifully diffusing pores with out caking and the luminous side just gives your face a timeless, brightened effect. Finally they gave us a subtle highlighter and not a garishly glittery extreme one! Calling your brow product a uni-brow is an interesting choice! This is definitely the prettiest brow pencil I've ever owned, the packaging is darling. This pencil is a medium ash brown with a angled shape and spoolie on the other end. The 2-step pencil is one and done, with a firm texture it's easy to shape and define. This was a little too dark for me but it's a nice brow pencil especially for doing full on brows and I love the packaging. Keep your makeup fresh all day long. Just spray, set, and go! You got this! 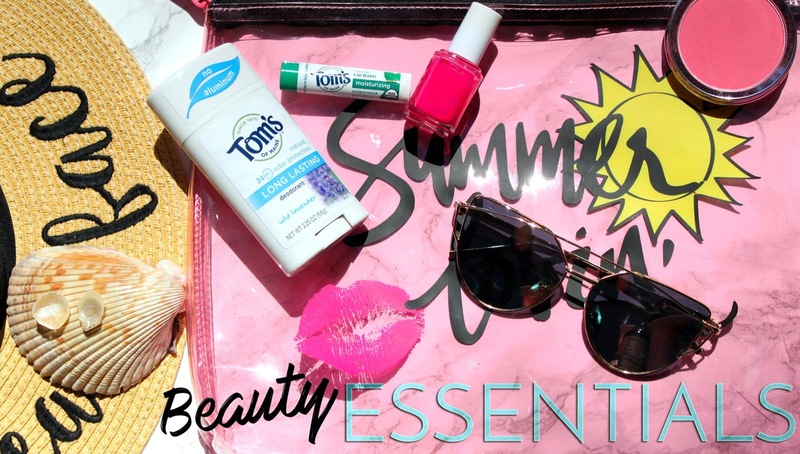 A makeup setting spray is a must in the Summer. 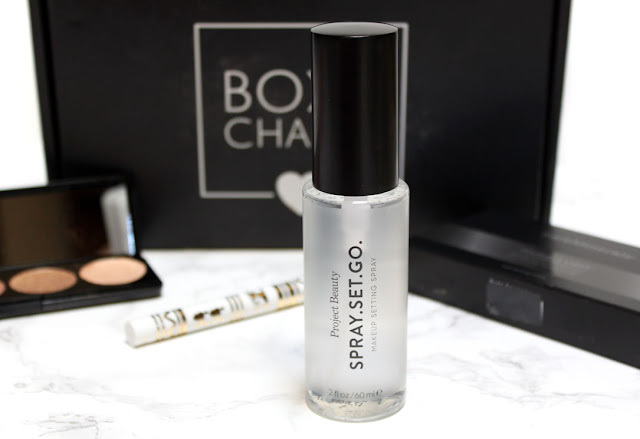 I normally use Urban Decay or Skindinvia's setting sprays but the small size on this one will be perfect for popping in to my purse for travel. It also doesn't have any weird fragrance. I really need to check out Project Beauty more, I ended up loving their strawberry banana yogurt shampoo and need to re-stock. BoxyCharm FINALLY gives us a full box of amazing products again. I was blown away by the value ($127) and awesome products in this months box. It seems they finally got the message! Remember if you subscribe during the same month a box is released you can still get the featured box of the month! Did you know Suzanne Somers had a makeup line? Me either! She has been a household name to me since the late 80's. I remember watching Three's Company re-runs with my Mom all of the time and recently cheering her on as a contestant on Dancing With The Stars. Plus, two words...Thigh Master. 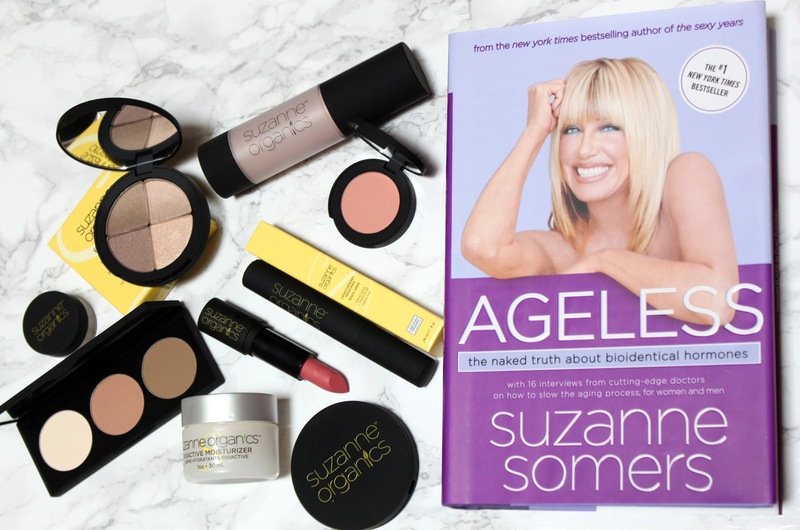 Suzanne is an infomercial legend and at 70 still one of the most gorgeous ageless women in Hollywood! Who doesn't want to know her secrets? After being diagnosed with Cancer (and beating it!) she immediately set out to cut toxins out of her life. She was shocked to discover how many chemicals were used in the name of beauty. By the time you finish your morning ritual in the bathroom you've likely been exposed to up to 200 chemicals. That is shocking! 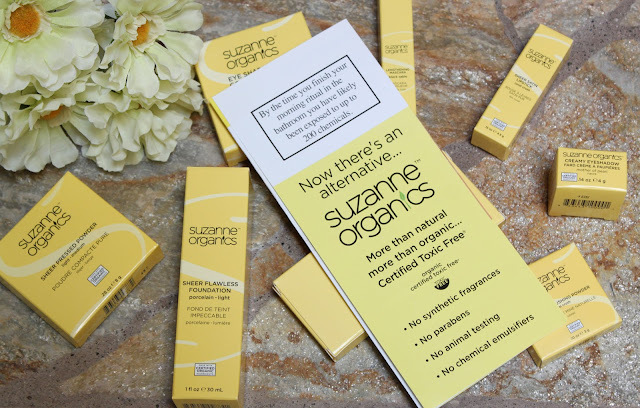 To give herself and others healthy alternatives, she launched the SUZANNE Organics Line which focused on natural ingredients and toxin-free organic cosmetics. In the Summer I prefer my makeup to be no-fuss and on the lighter low-maintenance side. 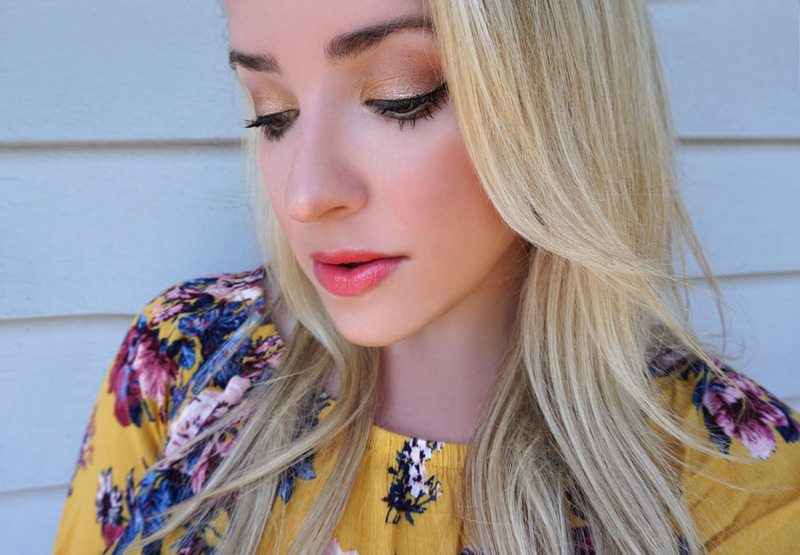 I like to keep the skin fresh faced with soft shimmering eyes and pops of coral on the cheeks and lips. 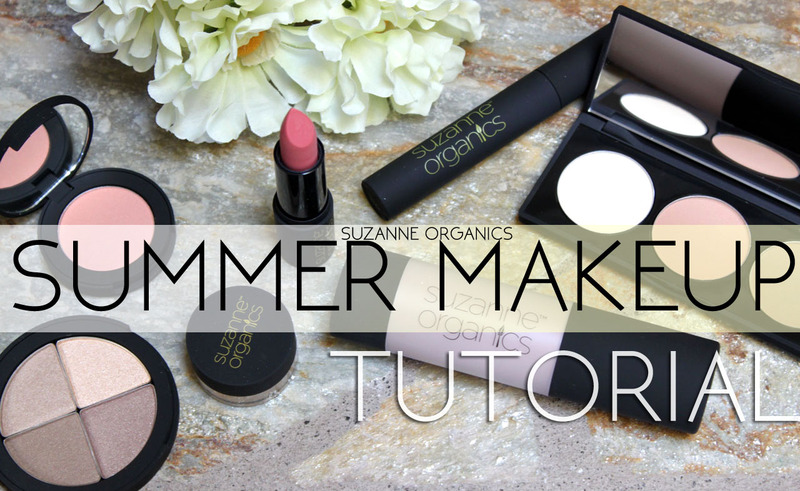 Here is how I get my every day Summer natural makeup look using the Suzanne Organics Cosmetics line! To prep my skin I moisturized with the BioActive Moisturizer from the 3-piece Bestsellers Skincare Kit. This amazing organic skincare tri-fecta targets fine lines and wrinkles for a more youthful, glowing complexion. 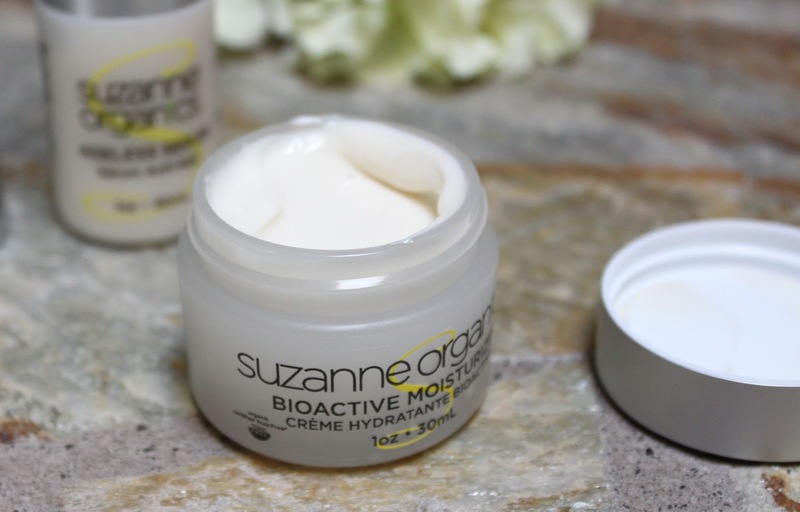 BioActive moisturizer organic face cream has a rich consistency but feels lightweight and sinks in to the skin. It's loaded with natural, botanical active ingredients, like CoQ10, Argan Oil, and Sea Buckthorn Berry, for youthful, ageless skin. The faint citrus scent of this lightweight cream is like taking a breath of fresh air in a California orange grove. So nice! While most foundations coat the skin with artificial dyes and fragrance, her Sheer Flawless Foundation uses nourishing actives and rich minerals with superior blending capabilities to seamlessly color-match a range of skin tones. It even has Aloe Leaf Juice as an ingredient which is wonderful during the Summer to soothe irritated skin when you have gotten a bit of sun. 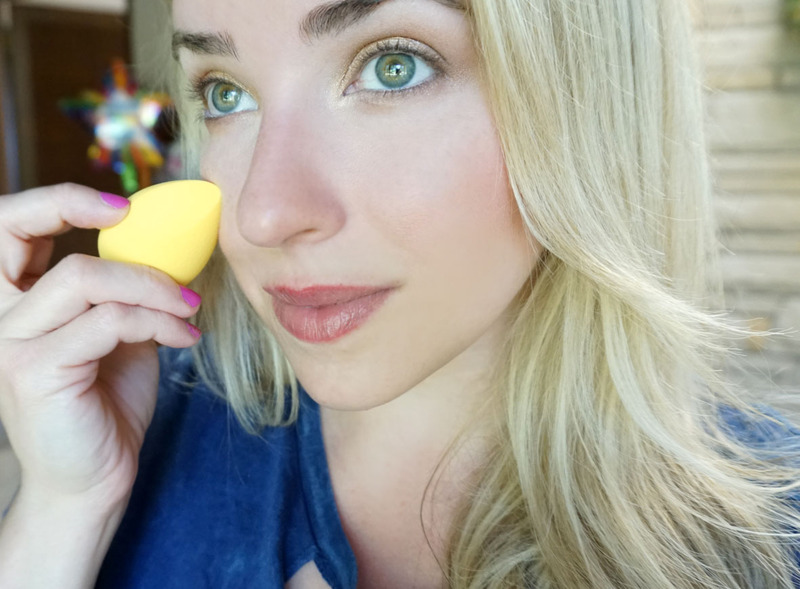 Starting with the base, I applied the Sheer Flawless Foundation in shade Porcelain with a damp beauty blender sponge only to areas needed. For me that's redness around the nose, and some dark spots on the cheeks. 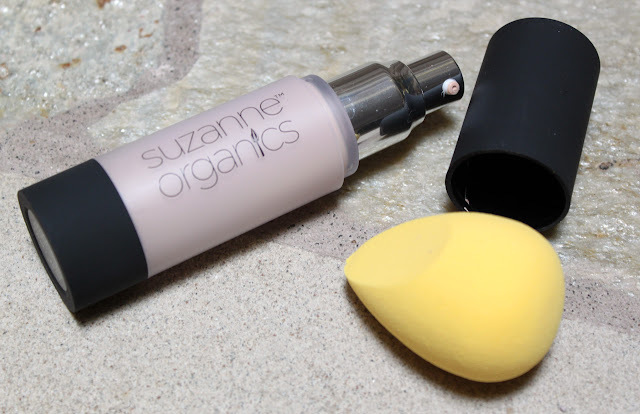 This organic foundation is a luxurious tint and similar to a tinted moisturizer. It's lightweight and feels almost undetectable on. Porcelain was a near perfect match for my pale cool tone skin, the tone is neutral so both cool and warm tones can wear this. With the light buildable coverage it allows your natural skin to show through. I like that it still lets my sun freckles be shown. There is also the most lovely fresh scent to it, no doubt from the Antioxidant-rich super juice blend that includes Pomegranate, Goji, Acai, Blueberry, Raspberry, Strawberry and more. 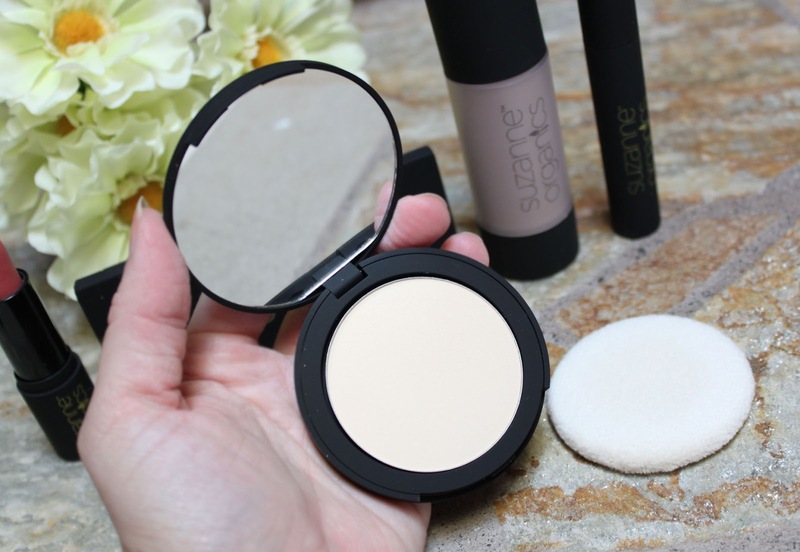 A light dusting of Sheer Pressed Powder in Light/Medium sets the foundation in to place. I focused primarily to my T-zone which tends to become more oily when it's hot out. 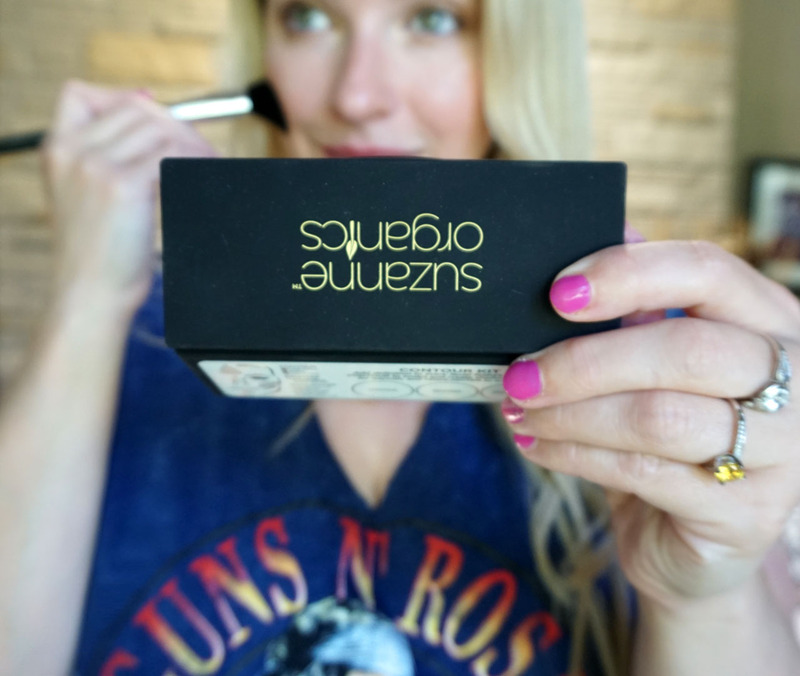 This powder is finely-milled so it doesn't look powdery or settle in to fine lines. Organic Jojoba Oil combined with mineral powders allow the skin to breathe while Bamboo and Tapioca powders decrease shine. I am really impressed by this powder! It sets invisibly and left my skin shine free for 6 hours. I didn't expect to enjoy this contour palette so much! The contour shade is a grey olive brown base, which you cool toned pale girls you know how important that is in avoiding the dreaded orange look. The highlight is more of a matte banana cream powder than the shimmering ones we're used to seeing. It works excellent for setting and brightening under the eyes. Despite the sun blazing nearly every day for weeks now, I still don't have anything close to a tan. Bronzer is my only hope in looking sunkissed! Using a fluffy brush I applied the bronzer to the outside edges of the face. Switching to a smaller defined cheek brush I contoured the hollows of the cheeks and down my nose. 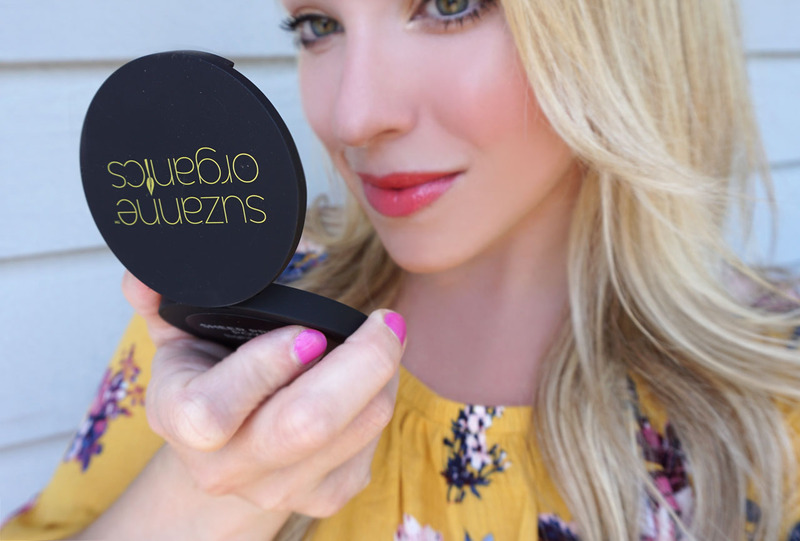 With a fan brush I lightly swept the highlight powder under the eyes to brighten and on the highlight points of the face. 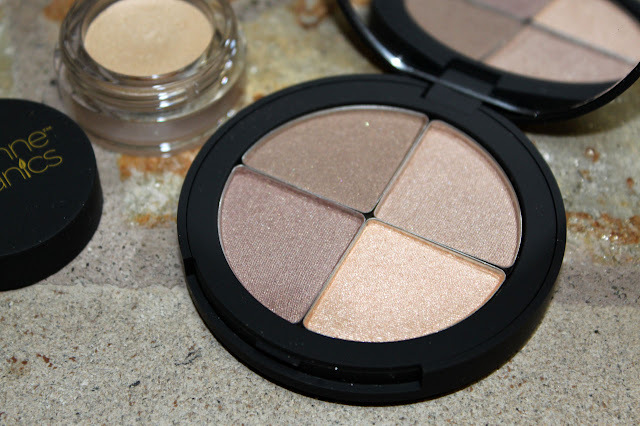 To get glowing, I added a touch of the Mother of Pearl Cream shadow across the tops of my cheekbones. For a soft pop of color I swirled on Coral Crush Natural Blushing Powder to the apples of my cheeks. 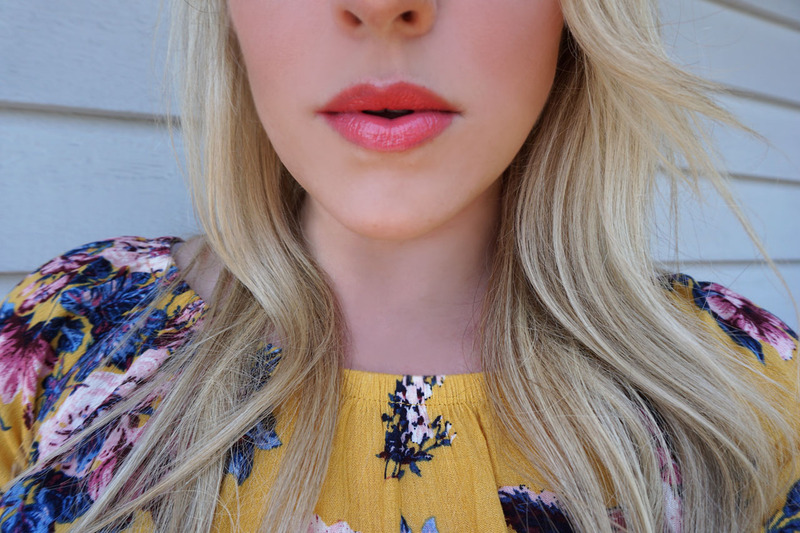 This satin peach shade is so flattering and natural looking on. Most conventional makeup use chemical silicones that feel great going onto the skin, but are actually toxic, plastic-based agents. This organic blush combines gorgeous colors from nature’s raspberries, cranberries and oranges with no artificial dyes or chemical binders. Just a pretty organic glow! Moving on to the eyes, I layed down a base of Mother Of Pearl Cream Shadow on my lids. The creamy champagne gold shade softly illuminates the eyes. The slightly tacky base helps the powder shadows to adhere and really shine. 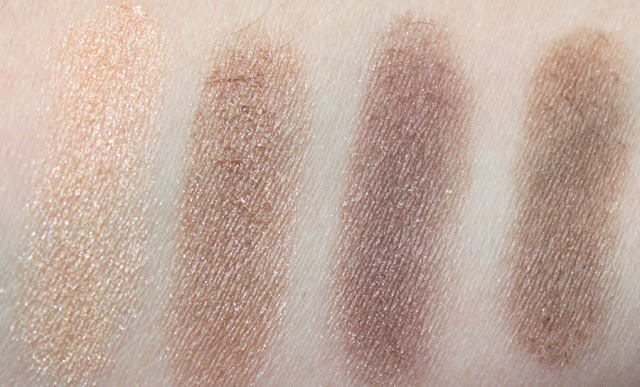 This cream shadow is super pretty as an inner corner highlight and can even be used to highlight the cheekbones. Golden Shimmer Eyeshadow Palette is the perfect set of shimmering neutrals for Summer. It's definitely my favorite product from from the line! The colors are so beautiful and even though the shadows are on the drier side they are very pigmented and shimmery with out being glittery. 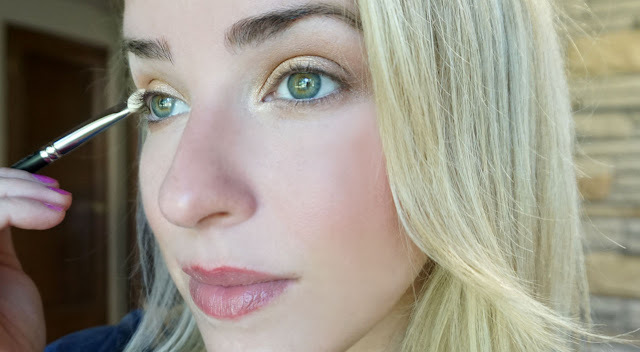 I placed the pale shimmering gold on the inner corners and 1/3rd of the lid, champagne shades extended outward, and brown to define the crease. It really is a perfect quad of fool-proof shining neutrals. I have been gravitating towards this palette so much over the past few weeks. When my allergies act up my eyes become very sensitive to any eye makeup and all of these products felt so comfortable on my eyes. I had zero problems with irritation when normally I can't wait to take my eye makeup off. Golden Shimmer Eyeshadow Palette Features "Stone," "Sparkling Champagne," "Topaz Shimmer" and "Spun Gold" Colors. Two coats of Lengthening Mascara in black gives you that bright wide eyed look with out being too much. 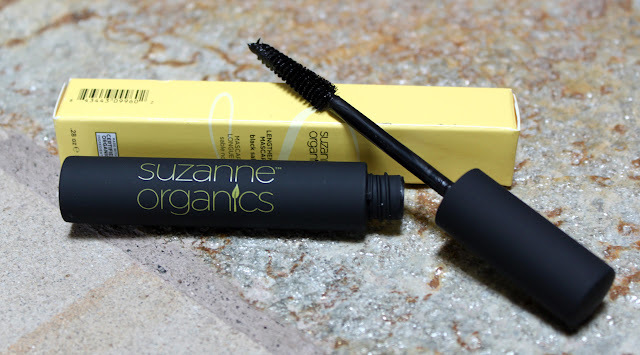 I am normally a volumizing mascara kind of girl but I really liked how long and separated this made my lashes. With a fine pointed tip it is easy to define each individual lash for clump-free lashes. The organic mascara formula is on the wet side, so give it a minute to dry. This mascara didn't irritate my sensitive eyes which I always appreciate. 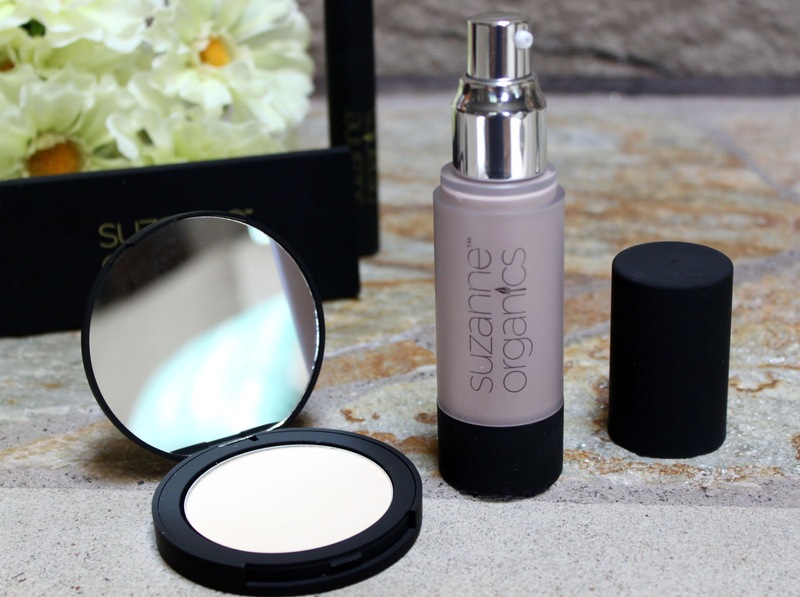 Suzanne Organics Sheer Satin Lipstick's are sheer, moisturizing, and give a soft natural color to the lips. They are actually tinted with natures berries and minerals! Shea, Cocoa, and Avocado Butter create a conditioning base for a sheer, beautiful look. 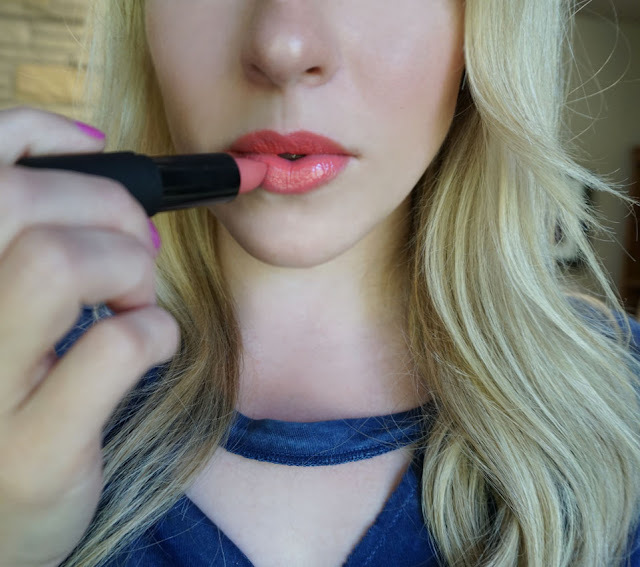 To finish off the look I applied Coral Crush Sheer Satin Lipstick. A warm medium coral pink is one of my go-to shades in the Summer, and really all year round. It looks polished with out being overdone. These lipsticks smell and taste amazing, like the tropics! The texture is creamy with a balmy moisturizing feel. There we have it! 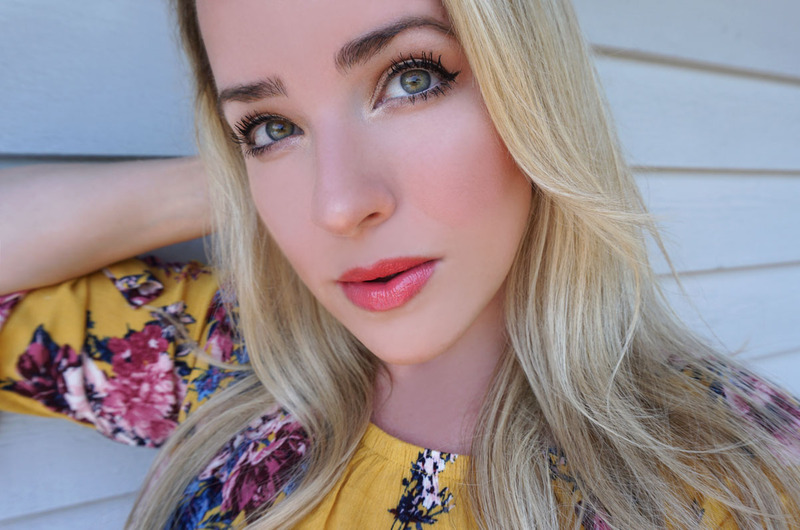 My natural Summer makeup look! I know quite a few of these products will be in daily rotation throughout the Summer season and beyond. Knowing that I am minimizing the chemicals I am putting on to my face every day feels really great. Finally, makeup that's actually good for you! 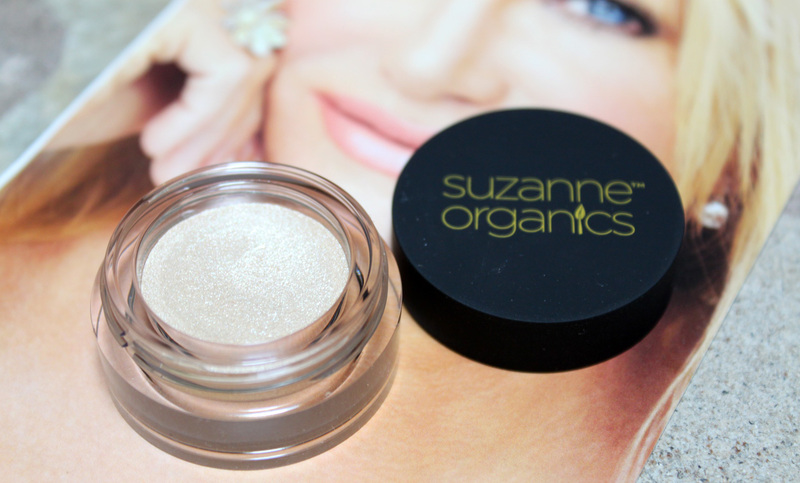 I am so pleased to have discovered Suzanne Somers Organics all natural makeup. 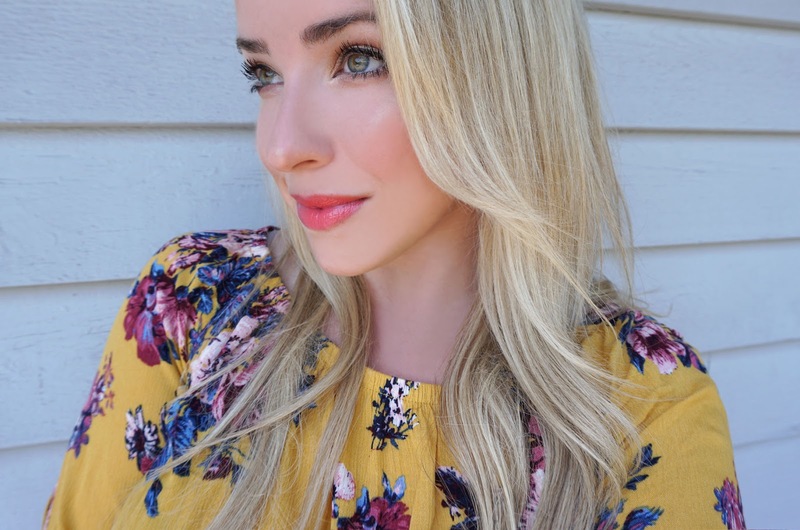 All of the products I tried were exactly what I was looking for in my Summer makeup routine with out the harmful ingredients I can do with out. Suzanne Organics are manufactured with certified organic ingredients. 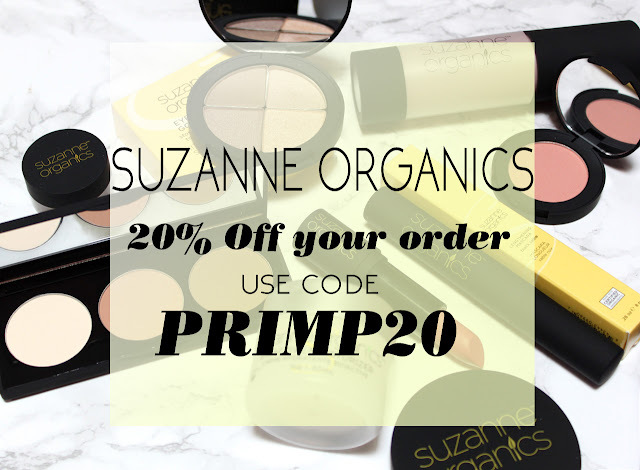 Free of artificial dyes synthetic fragrances, lead, chemical binders, PEGs or parabens. No animal testing and Made in the US. 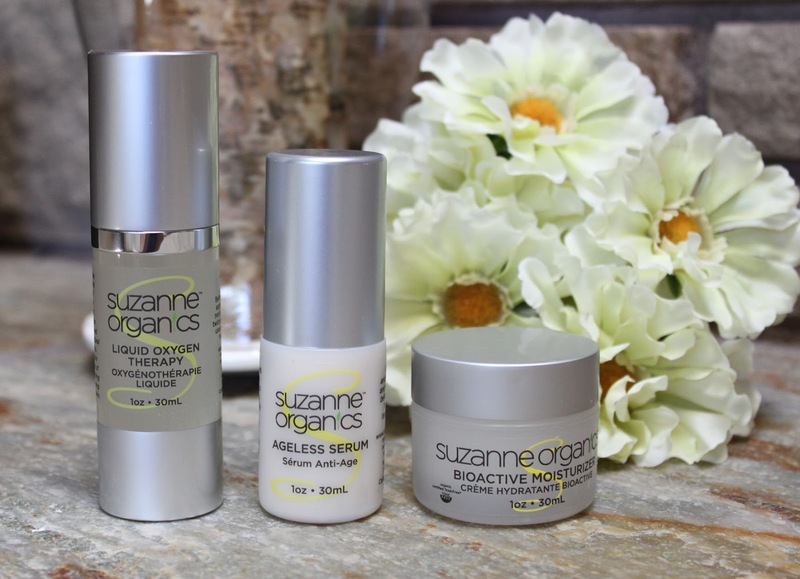 You can find all of these products and more at Suzanne Somers Organics.